Kathryn Evans, More of Me. Amulet Books, 2017. Pp. 312. ISBN 978-1-4197-2372-8. $17.95. In my experience of reading YA, many authors adopt just enough SFF elements (whether climate catastrophe, vampires and werewolves, or spaceships) to provide a decorative veneer for the romance they’re actually telling. Kathryn Evans’s More of Me does the exact opposite, adopting a teenage girl protagonist and her messy high school life as cover for a story about genetic engineering and cloning. It’s not a particularly deep story: the science is hand-wavey, the plot twists are predictable, the characters are teenagers, but for all that it is compulsively readable. Teva is a sixteen year old Everygirl, middle-class but not popular, and self-absorbed with her family drama, her best friend Madeeha, and her boyfriend Ollie. There’s something like the near-obligatory love triangle, complicated by the fact that it’s really a love quadrangle. You see, Teva harbors a secret: she unwillingly clones herself each year, cells multiplying and splitting off until a second, mirror self detaches. That self will become the “new” Teva and take over a public life of school and friends, while her previous incarnations from Fifteen to Six stay hidden away at home, unaging. Their mother, an overweight and depressive dowd who makes ends meet by rotely producing romance novels, wants to keep her children safe by limiting their exposure to the outside world, and thus her own; we are told the only person she ever sees is the grocery man, though it’s unclear if she goes out for shopping or if everything is delivered, though in the vague present day of the story we can assume the latter. Teva’s relationship with Ollie is complicated because Fifteen is still in love with him, while Teva only goes through the motions. In this stultifying atmosphere, Teva dreads the moment when she must inevitably disappear and her own clone take over, and she begins an unlikely search for answers that lead her to her long-lost father. Teva’s predicament is painfully highlighted when her Textiles teacher wants her to take part in a school fashion show with invited company representatives who can provide college scholarships and work internships—the sort of coveted prizes that are of no use to Teva herself, who will never be able to attend school or have a career, but which will be passed down to her future clones. Like Buffy the Vampire Slayer’s constant apocalypses, Teva’s clones are a metaphor for most teenagers’ inability to imagine or plan for a future, or rather, a future that doesn’t threaten her being. When the split begins early, starting with the development of a second fingernail and then a second finger, she goes to the Internet for help: creating a blog and a Facebook account under pseudonyms, and begging for help this way. This is perhaps the most realistic part of the book, as… nothing happens. The only responses are Viagra spammers, and a handful of anonymous, encouraging comments. The net is neither a panacea nor a threat to a random teenager, and for once this is reflected (in contrast to another YA book I read this summer, Zan Romanoff’s Grace and the Fever, in which a lot happens because of social media). Like perhaps too many teenagers, Teva doesn’t have a handy “trusted adult” to confide in, or ask for help; she has to solve things for herself as best she can. The final act of the book is the messiest, with a lot happening in a short period of time. There are several vivid scenes of body horror that may leave some readers queasy, though at the same time they provide some of Evan’s finest writing. The descriptions are sharp and visceral, and in high contrast to the emotional anxiety of the rest of the novel. There is also an epilogue that provides something like a happy ending, but leaves the story the weaker for it; the reader by this point has earned the right to see how things have changed organically. As it is, the epilogue ties up almost as many loose ends as the infamous conclusion to the Harry Potter series, though only in a space of months rather than years. 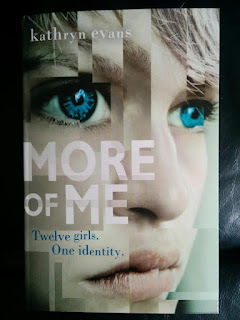 More of Me comes incredibly close to being a true departure in genre and form because of its emphasis on the logic of cloning (a logic that in some ways recalls that of Flowers for Algernon), but in the end Evans chooses to play it safe, repeating those steps that have worked for other YA efforts. Robert Heinlein had the old saw that to write a juvenile novel, you made the protagonist seventeen and told the rest of the story the way you would have done anyway. Evans’s novel draws upon this dictum, but ultimately discards it for the familiar YA story beats we have come to expect.